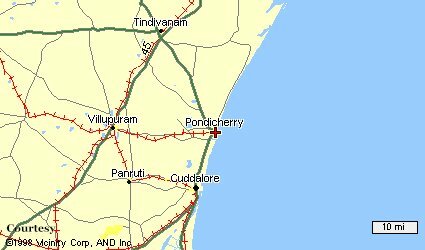 Our Pondicherry map shows the Pondicherry routes and nearby cities. Bus : One of the best Inter-State bus systems cater to the needs of travelers to and from Chennai. The State Transport Express buses and also other private buses are operating in Pondicherry connecting with Chennai, Mahabalipuram, Nagapattinam, Karaikal, Thanjavur,Chidambaram, Cuddalore, Bangalore, Tirupathi and Coimbatore.